Which company makes it its mission to inspire moments of optimism and happiness, to create value and make a difference? Unfortunately, not a pension fund. This is the mission statement from Coca-Cola. However, the largest pension funds are aspiring do something similar – writing up their investment beliefs and strategy and communicating them. More pension funds should follow their lead to improve investment governance and long-term performance.Pension funds have already made major strides in investment governance, investing heavily in risk management after the 2008-9 financial crises. Regulators also have been supportive, introducing a barrage of new rules and guidelines, while risk aversion has led funds to shed complex and structured products. This certainly has helped clear the pension board’s agenda. It is less certain whether it will help the fund’s goals in the long term. Despite all the measures taken, the basic uncertainties that drive risk and return in the financial markets still have not been tackled. Investment beliefs address this uncertainty, by developing explicit views on how financial markets work and what it means for the fund. This is not a mere academic debate. Well-managed pension funds have explicit investment beliefs in common. Pension researchers Gordon Clark and Roger Urwin find that well governed pension funds realise between 1 and 2 per cent return per year more compared to their less well governed funds. Combined with the interest-on-interest magic, this should entice trustees to give their investment beliefs a hard look. Investment beliefs are not a contest to rewrite the declaration of independence. It is more mundane. For example, how does a pension fund view diversification? After 2008 the sector has learned that diversification does not add up to adding new strategies. We also do not really need diversification most of the time – especially in mainly downward markets. Even with a relatively simple concept like diversification, the prepared trustee should grasp the concept, as well as developing a view on what diversification means to his fund. Another investment belief concerns active management; chasing returns beyond a benchmark. For active management to be successful, several steps need to be in place. There has to be an identification of potential over- or undervaluation of a security or asset, based on sound theory of arguments. There has to be a strategy in place to exploit discrepancy in valuation. Subsequently, there has to be a selection and monitoring process to hire the right managers to exploit this strategy. Finally, there has to be a level of assurance that all the research and work can be repeated a couple of times, at least to recoup the investment, until the valuation discrepancy dwindles away. In summary, a belief in active management is workable if it is based on arguments to defend it, a strategy to exploit it and an organisation to support it. What’s in it for the trustee? Developing beliefs are first of all self-disciplining. It saves a lot of time during meetings, and narrows down any new strategy proposal to some simple questions: do they fit, and enhance the investment beliefs ? 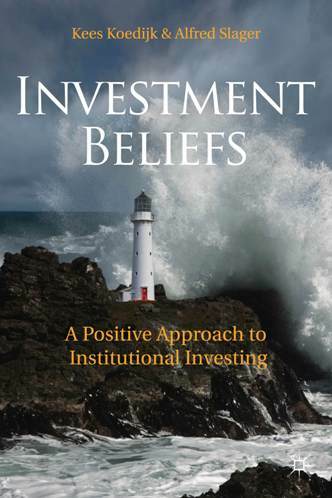 Investment beliefs are not meant to be overhauled each year, but financial markets and research are dynamic. What’s in it for the asset manager? He has to work harder for his money. The pension fund now has a new instrument in his tool box when selecting and monitoring asset managers. What’s in it for the participant? Well-thought out beliefs help the participant better understand the investment risks taken by the fund, as well as the opportunities sought by the pension fund. It should help avoid nasty surprises such as participants finding out their fund’s returns were more volatile than expected. Rather than searching for the next nugget of gold in the market or the best managers, trustees should spend some time on explicating investment beliefs. It will be well worth the effort. This entry was posted in Blog and tagged governance, Investment, risk management. Bookmark the permalink.